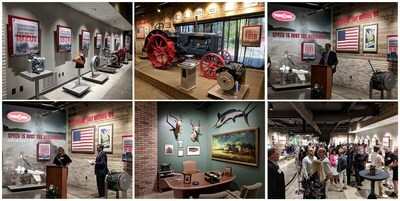 Twin Disc Unveils Heritage Gallery in Honor of 100th Anniversary | Twin Disc, Inc.
RACINE, Wis., Aug. 6, 2018 /PRNewswire/ -- Twin Disc, Inc. (NASDAQ: TWIN), a global leader in power transmission technology for marine and land-based applications, unveiled the Twin Disc Heritage Gallery on Aug. 2, at the company's Racine headquarters, in celebration of its 100th anniversary. "In honor of our centennial we wanted to share our proud history with the community of Racine," said John Batten, president and CEO of Twin Disc. "I can't think of another town this size that has this many long-lasting companies, and it's because of the people of this great city that we have been able to grow and thrive for 100 years." Twin Disc products, from the first marine transmission prototype to the E-Type flywheel clutch and Power-Shift Transmission, are on display, along with progressing generations of Twin Disc's machine parts over the company's 100-year history. Also on display at the gallery are a variety of Twin Disc memorabilia, including the first meeting minutes between the company's founders, original stock certificates, and a Wallis tractor equipped with a Twin Disc farm factory clutches, which was the original product that helped launch Twin Disc in 1918. The gallery's most distinguished feature is a section dedicated to the decade that defines the very backbone of Twin Disc throughout its 100-year history, the lead into World War II, when Twin Disc was asked to design a marine transmission for the Higgins Landing Craft that would be used throughout the South Pacific and the D-Day invasion. "The transmission only had to last 50 hours and reverse was not needed because we were told they would only be going one way," Batten said, during his dedication speech to the roughly 100 guests in attendance. "Twin Disc's engineers, some of whom were veterans of World War I, would not accept a vessel that would deliver our troops into battle and not bring them home safely. Nor would they accept 50 hours of service life."